SLOW ROOM is Jonathan Schipper’s first solo-exhibition at Pool Gallery in Berlin. Jonathan Schipper‘s kinetic sculpture is contemporary in every sense. Utilizing electronic and/or mechanical technology, Schipper who lives and works in New York creates gracefully hi-tech works that simultaneously maintain a visceral classical romanticism. It is appropriate to suggest “irreversibility” as the core – or at least most ubiquitous – theme present in Schipper‘s work. 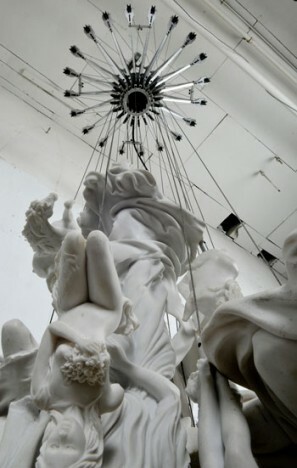 When it comes to the site-specific sculptural installation SLOW ROOM, the metaphorical and theoretical implications that relate to the concept of irreversibility are twofold: the irreversibility inherent to progress – civilization, modernization, science and technology; and the irreversibility of life itself, the non-stop journey from birth to death. In resistance to the ever-increasing speed of progress, Schipper decelerates his objets an art, thusly highlighting the hyperspeed that surrounds and consumes our modern lives. His work often incorporates familiar material items, and SLOW ROOM certainly does, its foundational metaphor holding our possessions as extensions of ourselves. As SLOW ROOM progresses – it is a moving sculptural installation which takes roundabout a month to arrive in its final state – it becomes a vanitas-in-motion, a tribute to the fleeting nature of life and a reminder: memento mori.